The City of Dublin Steam Packet Company - The Shipping History on the Holyhead to Ireland Route. The City of Dublin Steam Packet Company (CofDSPCo) was formed in Dublin in 1822, and was originally called Charles Wye Williams and Company. On the 24th January 1839 they were contracted to run a night mail service from Holyhead to Ireland carrying the Royal Mail on behalf of the Post Office. Their ships operated from the Admiralty Pier in Holyhead. On the 1st August 1848 the first mail train to connect with the ships ran in to Holyhead, operated by the Chester and Holyhead Railway Company. The train named the 'Irish Mail' was actually the first train in the world to be given a name. In 1859 , the CofDSPCo ordered 4 ships, each named after one of the provinces of Ireland - Connaught, Leinster, Munster, and Ulster. They were collectively known as 'The Provinces'. They bore the illustrious prefix R.M.S. - Royal Mail Steamer. It would not be until 1920 that the rival LNWR company ships would finally carry the mail. In 1883 a new contract for the Irish Mail sea voyage was won by the LNWR, but due to an uproar in the House of Commons by Irish Politicians it was re-awarded to the CofDSPCo. In 1897, as a result of winning a further 21 year contract with the Post Office, the CofDSPCo ordered four identically named replacement ships. They were twin screw steam ships built by Cammell Lairds of Birkenhead. Each ship cost £95,000 and grossed 2646 tons. They were 115 metres long, and were powered by an 8 cylinder steam engine, producing speeds of 24 knots. 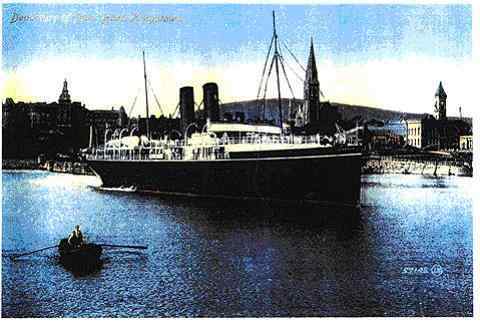 The ships included an on board sorting office manned by members of the Dublin Post Office. Trade with Ireland was increasing all of the while, when two major events changed the fortunes of the company. Firstly there was the division of Ireland, and even more dramatic for the company was the first world war. In 1915 the R.M.S. Connaught was commandeered by the War Office , and put into service as a troop carrier. 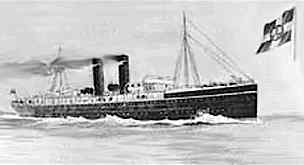 The three other 'Provinces' ships continued to operate on the route between Ireland and Holyhead. On the 3rd March 1917, Connaught was hit by a torpedo whilst sailing through the English Channel. Three lives were lost. The three remaining ships had for the most part escaped any involvement with U-boats in the Irish Sea until late in the war. On the 10th of October 1918, this was to tragically change. A little before nine o'clock in the morning, the RMS Leinster left Kingstown (later re-named Dun Laoghaire) on route for Holyhead. Three members of the Royal Navy manned 12 pound guns on board as a precaution. Including these three men there totalled 771 people on board. Of these, 489 were military and 180 were civilian passengers. 22 Dublin Post Office workers and 77 crew accounted for the rest. An hour into her journey, a torpedo was launched by U-boat UB-123, which just missed the Leinster. A second torpedo struck the Leinster in the area of the sorting room, and just one of the 22 workers inside would survive. Captain William Birch - Irish, but living in Holyhead - lived in a property named 'The Sycamores'. He gave the order to turn the ship around and attempt to get back to Kingstown harbour. The third torpedo struck amidships in the engine room, causing devastating damage, and the ship began to sink. Survivors found themselves struggling in rough seas, and by the time rescue boats arrived 501 souls would have perished. 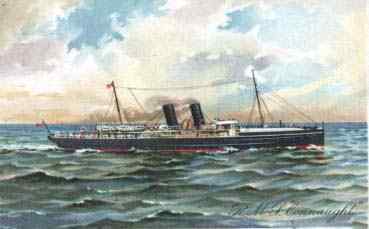 This was the largest maritime disaster ever witnessed on the Irish Sea, with multi national loss of life, including Welsh, Irish, Scottish, English, Canadians, Americans, New Zealanders and Australians. In the 1990`s, one of Leinster's anchors was raised from the depths, and now rests opposite the Carlisle Pier in Dun Laoghaire (was Kingstown), from where she sailed on that fateful and tragic day. The Leinster now lies about 12 miles off shore, with her severed bow pointing south. The main part of the wreck, which though still intact is extensively damaged, is slowly sinking below the sands. Following the war the City of Dublin Steam Packet Company could not financially recover from the loss of its ships, and in 1920 the Irish Mail contract was finally awarded to the company's rival for 70 years, the London and North Western Railway Company.